Ahhh…friends. Good friends. Great friends. Best friends. They’ve been with you through thick and thin. The good and the bad. And the ups and downs. And through it all, they’ve always showed you their unconditional love and support, either with a shoulder to cry on or with shouts of joy and happiness. You consider your friends to be really precious—and such an important part of your life. So why not get everyone together to celebrate exactly that which is so very special to all of you: your dear friendship. One great way to do this is to host a luncheon. But not just any luncheon. A friendship luncheon! This is your chance to get together and talk, laugh, cry, reminisce, linger, and relax. The focus is squarely on the beautiful bond you all share. 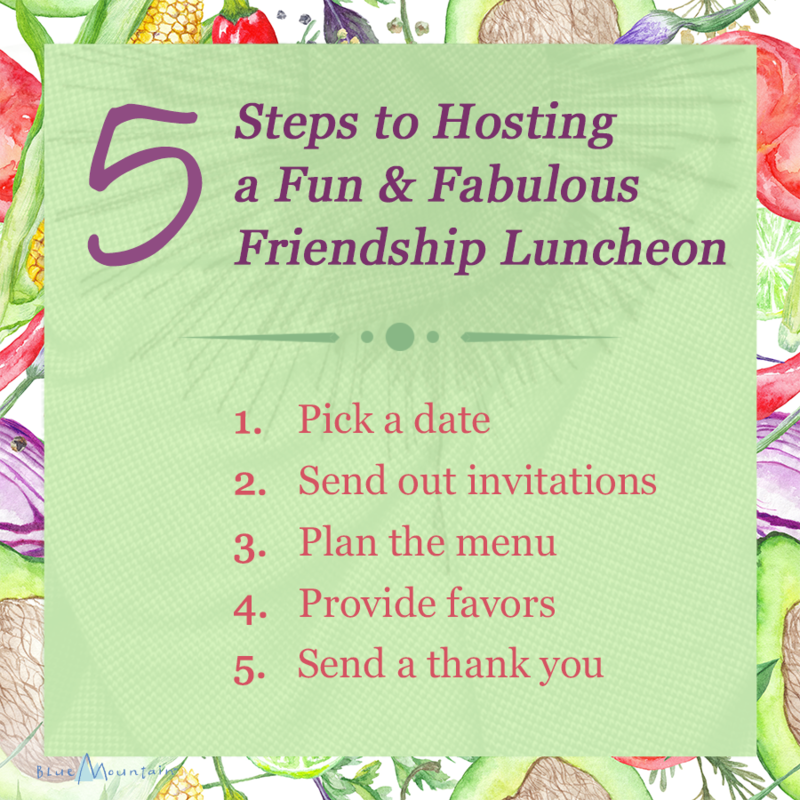 To help you plan this get-together, the editors at Blue Mountain have compiled a list of 5 simple steps to hosting a fun and fabulous friendship luncheon. We think you’ll find these tips extremely helpful. Now enjoy! Send out invitations. It’s so much more fun to make your friendship luncheon official with a pretty invitation. You might want to print out something nice on paper stationery and actually mail it to your friends. Or you might want to choose a special eCard to email instead. Regardless, you’ll want to include all the basic details: date, time, location, RSVP date, and contact information (either a phone number or email address). If you’ve decided to set up your party as a potluck, be sure to also include which food/drink you’d like your guests to bring. Make sure to send your invitations at least 4-6 weeks before your event in order to give guests plenty of time to plan ahead. Plan the menu. Here’s where it gets fun! If you don’t already have a fixed menu in mind, try to narrow it down by thinking through a few things first. Do you have a specific budget? Do you want your luncheon to be formal or casual? Do you want everyone to mingle buffet-style or sit down? Do you have a theme? (Think ladies’ tea, New York deli, light and healthy, or a Mexican fiesta for just a few ideas.) Do your guests have any food restrictions or allergies? Do you plan to serve alcohol (such as wine, sangria, Champagne, or a fruity cocktail)? The answers to these questions will help you decide exactly what you’d like to serve. Just remember, whatever you do, this isn’t the time to be experimenting with something brand new or complicated. That will only add to the anxiety level. Go with what you know and are comfortable with. After that, relax and have fun! Provide favors. Offering a favor to each of your guests is a really nice and personal touch they are sure to appreciate! These can be given upon arrival, displayed on your luncheon table, or passed out as a parting gift. They don’t have to be expensive or fancy or even over-the-top. But to help make your luncheon more personally memorable, they should be a gift that honors your friendship. A few ideas include a laminated throw-back photo of your group made into a magnet; a stem, bouquet, or pot of flowers that signify friendship (such as chrysanthemums, geraniums, ivy, yellow roses, or zinnias); or a meaningful quote printed out, placed into a lovely frame, and displayed at each place setting. Send a thank you. Although it’s probably more common for guests to send a thank you to their host, it’s also just as thoughtful for a host to send a thank you to her guests for coming. Be sure to include something personal in each note that shows you took the time to reflect on your special friendship. There are so many lovely thank you eCards to choose from. Be sure to pick one that both reflects your style and conveys your message. If you need help with what to write in your thank you note, check out these helpful tips. 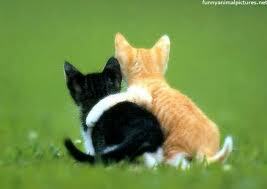 Don’t Forget Friendship Day This Weekend! Friends are some of the most important people in our lives. They are always there for us, whether we need a good laugh, cry, or anything in between. 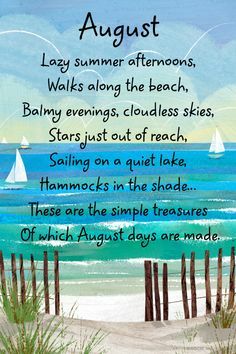 These relationships should be cherished and celebrated – especially this weekend because Sunday, August 5 is Friendship Day! Spend the day with good friends on a fun adventure, or maybe just stay in and reminisce about all the memories you’ve made together over the years. Don’t live near your closest friends? Plan a good hour or two to catch up on the phone. 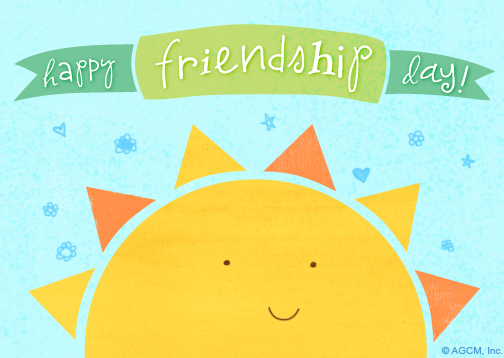 Sending a friendship eCard is a sweet gesture that is sure to make your friends smile, or post a digital postcard on facebook to let everyone know that it’s Friendship Day. 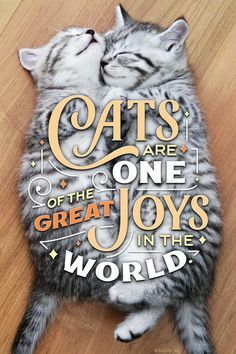 Remember, every friend deserves a little reminder of how special they are! The word “friend” is probably laden with as many nuances of meaning as the word “love.” After all, we have a wide variety of people in our lives that we might by some definition call friends, and we have a host of people to whom we attach some semblance of love. Some people are friends by virtue of proximity, meaning you see them at exercise class every week or you see them sitting in the same pew at church on Sunday’s, you exchange a few pleasantries, learn each other’s names, and are in some measure, friends. Some people are the lifelong buddies of days gone by. They know everything about you, or at least who you once were. Sometimes they remember things you had long ago forgotten, and actually wish they would forget too, when their old information about you no longer fits who you are today. Still, these are the people who are gold, the ones carved with lasting memories, the ones who remain in your heart forever and no time or distance can break the bond. No matter what lens you use to see the friends who surround you, they are all important. They all remind you that every experience in life is more beautiful when it is shared with a friend, with someone we love. 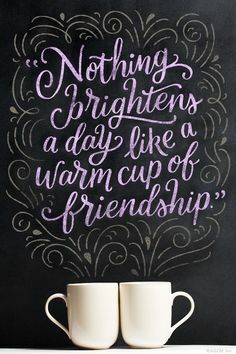 Give a warm shout to your friends today and thank them for being such a wonderful part of your life.